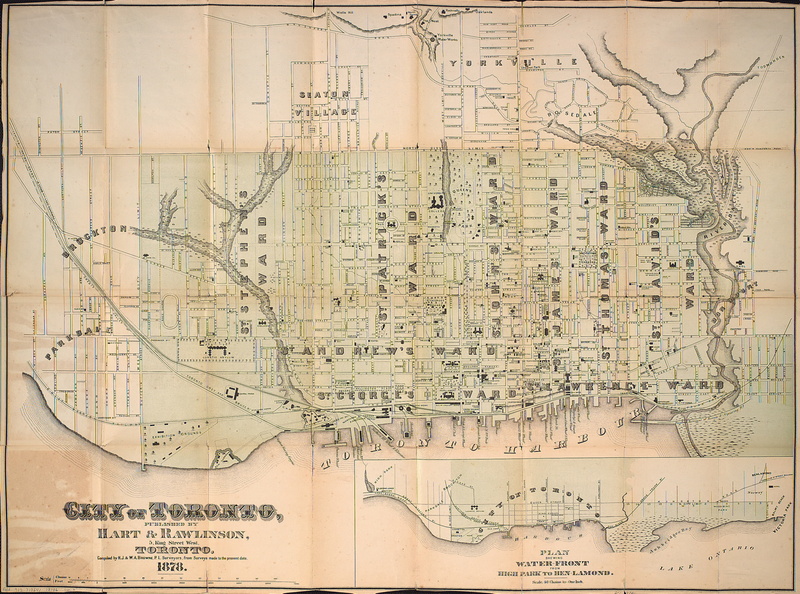 There’s an amazing set of books online entitled “Robertson’s Landmarks of Toronto: a collection of historical sketches of the old town of York, from 1782 until 1837, and of Toronto from 1834 to 1893” written in 1894, and 5 subsequent volumes that include other “historical sketches” up until 1914. This guy John Ross Robertson was a man after my own heart. He created arguably the first school paper in Canada (in which he put public pressure on Upper Canada College in order to save a playground), he published both a sports periodical and a satirical weekly, he was an independent politician and eventually very powerful journalist, a philanthropist, and he also loved himself some history. That’s not to say he was necessarily the most pleasant guy in Toronto, apparently he paid his employees very little and was sometimes overly staunch in his dealings with both colleagues and competitors. Regardless, I’m impressed with the man. But this is all incredible tangential, I’m not even talking about a J.R.R. today. In the 6th volume of Roberton’s “landmarks” series, there is a heading called “Seaton Village of Old.” Robertson laments that the name Seaton Village isn’t much used at the time of writing, but I was well aware of the name in the time of this writing. I guess much later, when the need arose to differentiate neighborhoods in a large city, the name for this neighburhood, bounded by Bloor, Christie, just north of Dupont, and Bathurst resurfaced and is now in wide use today. It was originally part of a the Crookshank Estate (currently one of the front runners for the Hogtown Crier Award for Best Name 2015) that was portioned off into smaller properties and sold starting in the 1850s. Of course, the name wasn’t a throwback to create a sense community in the thick of Toronto back then, it was truly its own village, part of the township of York, and just bordering Toronto’s most northern city limit. For some weird reason this map, from 1857, is oriented with up being West (I think everyone read English from up to down in the 1850s before evolving into our current left to right. That makes sense, right? Left?). If you can see it, keep an eye on lot 133, on Markham St. just North (right) of London St. This one, from 1878, situations Seaton Village nicely in the TO context. It’s basically early Toronto’s hat. Or current Toronto’s Vaughan. What really compelled me about this section in Robertson’s volume was this sentence: “perhaps the most interesting person in the village was “Mammy” Brown, a colored woman, who was said to have been over a hundred years old when she died.” According to quotes from Mrs. Brooks, this woman’s daughter, “Mammy” Brown lived to be 111 years old after living in this old cottage at 691 Markham Street for 50 years, apparently the first to be built in Seaton village. She also said that her mother and father were escaped slaves from Maryland, who had both run away together because her father was about to be sold. There’s lots about this account that was fascinating to me. 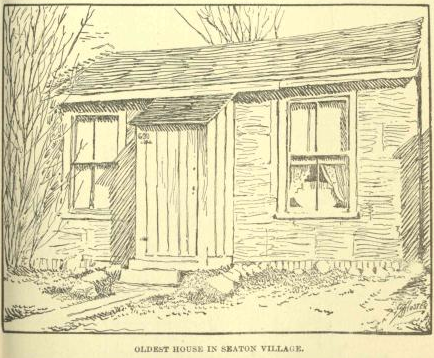 This woman’s astonishing age (given the life expectancy for women during her time was around 50 years old), her cottage being the first Seaton Village, her escape from slavery. Now, lots of these kinds of written histories are really interesting but contain lots of errors, so my first thought was that lots of this should come with a few grains of salt. But I wanted to do as much digging as I could, and had no reason not to believe these quotes from Mrs. Brooks about her mother. 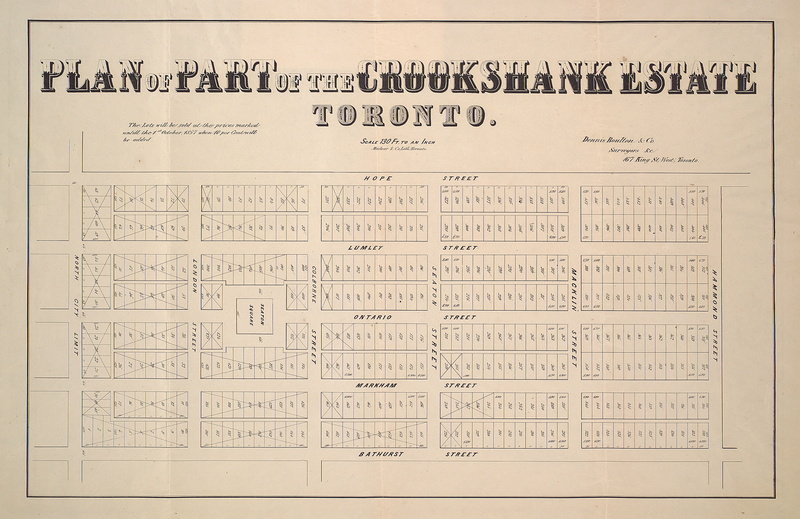 Deborah “Mammy” Brown apparently arrived in Toronto in approximately 1856 with her husband Perry, and immediately settled on the #133 lot of the Crookshank estate, securing the deed of ownership in 1870. Perry died around 1871, but the property was transferred to Deborah. She appears in the city directory as “Brown, Mrs. D., wid P., Markham” and also just as “Brown, Mrs. D.” One city directory says she lives at “Markham, 1 n of London,” and another says “Brown Deborah (wid. Perry), h n e corner Markham and London,” which I’m guessing means her house was on the Northeast corner of that intersection, right where lot 133 is. This one’s my favourite. I’ll tell you why in a second. The above map is from 1884, which actually well after Seaton Village had been established, and “Mammy” Brown is well into her 100s. But what I like about it is that you can see a small building on lot 133 on Markham Street (on the right side of the image near the bottom), right in the heart of the neighborhood, undoubtedly the Browns’ cottage, the one that just might be the oldest in Seaton Village. So my next question was, where exactly did Deborah and Perry Brown come from? Unfortunately the personal history of slaves is difficult to track for a number of reasons, but I gave it a shot using the online Maryland Archives. I did find a copy of a description of a slave named Deborah who had been manumitted by one Bennett Darnall in Anne Arundal County in Maryland in 1805, who was approximately 17 years old at the time. I say approximately intentionally here because that’s what this government record stated; there were usually no birth records kept for those born into slavery. That would put this young woman’s year of birth at around 1788. “Mammy” Brown died in 1898 at approximately 111 years old, so she would have been born around 1787. Now, my first thought was that claiming she was released as a young woman doesn’t jive with Mrs. Brooks’ description of her parents both running away, but it could be that she was a free woman and ran away with Perry because he was still enslaved and was going to have to move somewhere either too far, or where she wouldn’t be able to live as a free woman. But this is all just guessing. Who knows, the dates and name could be entirely coincidental. But that’s the most definitive thing I could find in Maryland. 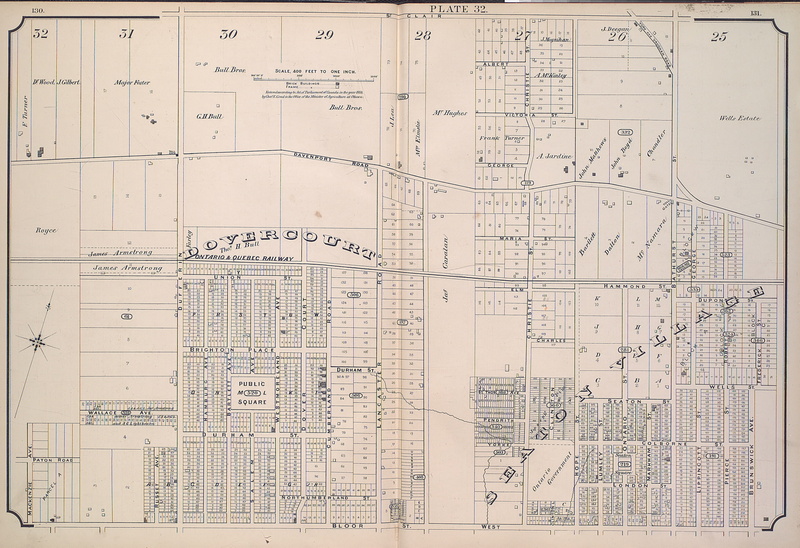 Like I said, Deborah Brown passed away in 1898, over ten years after Seaton Village was officially annexed into the city of Toronto. Now I’m going to move into pure conjecture zone here given I know nothing about her personality or social life other than the fact that she taught Sunday school even into her old age, but the picture this paints is really intriguing. Picture this woman, formerly a slave, living in this tiny cottage for over 50 years, almost 30 of them as a widow, as a village and soon a city starts to grow around her. I can’t imagine her perspective coming from where she had come from in the early 1800s, and seeing a growing industrial city evolve and expand, and a country basically be born, all while she was an adult. It’s like…well, imagine being born around 1880, being an adult before the 20th century even starts, and almost living to see Y2K. Or for that matter, being born in the 1980s and living to almost see the year 2100. I can’t even wrap my mind around 2020 and the foggy mist of self-driving cars and singularities and environmental chaos’, let alone what 2098 might look like. Anyway, Deborah “Mammy” Brown’s obituary was titled “Toronto’s Oldest Resident”, and her legacy was recently honoured by the Seaton Village Lane Naming Project, which changed the name of one of the back lanes of Seaton Village to Deborah Brown lane, right behind where her old cottage sat. 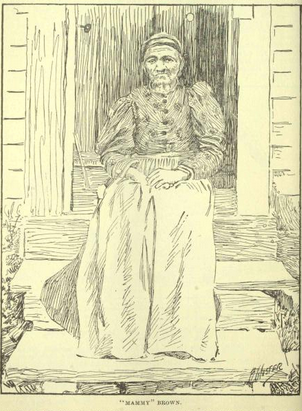 I have no idea how Robertson got a sketch of Deborah Brown when he only wrote about her ten years after she died, but…here’s the only potential image of her on her cottage steps.